Home page > Events > Talks & Ideas > What do the Scots and English have in common ? What do the Scots and English have in common ? Three centuries after the Act of Union, a year and a half after the Independence Referendum, the question is still being hotly debated. Join us for a lively discussion in the run-up to the Holyrood Elections – and to St George’s Day. Éric Albert, correspondent for le Monde in London, and Etienne Duval, an Edinburgh-based TV reporter have both recently written books on the subject: Les Anglais, dans le doute! 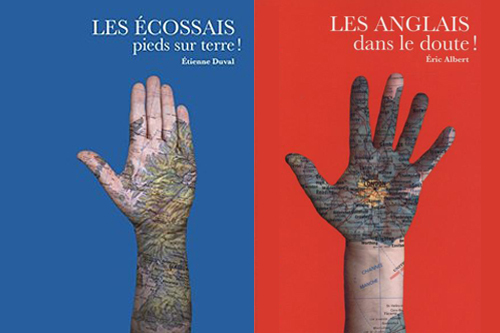 (Éric Albert) and Les Écossais, pieds sur terre! (Etienne Duval), both published by Ateliers Henry Dougier. Each will attempt to answer the question, and any you might have, from “their” perspective.